This is my favorite spot. The water runs 24/7, there is hardly anyone on the river, and there are plenty of fun play spots. This is the best that Maine has to offer. The standard flow is 500+ cfs, but big rains can result in big releases and big loads of fun. Brookfield normally has a 1500 cfs boaters release on the Saturday of Labor Day weekend, which amps up the excitement. Penobscot Paddle & Chowder Society members John Brower & Suzanne Cole at Seboomook. Half the paddle requires twice the paddler. At the normal 500+ cfs level, none of the holes are overly retentive and the river is an easy Class III run with a pool after every rapid. At that level, this is a great river for beginner boaters. As the CFS increases, the rapids get bigger, the holes get more retentive, and the degree of difficulty definitely increases. However, up to 3500 cfs, the run is basically the same line–just a lot bigger. I have not run the river at the 4500+ cfs release, but have been told the river changes dramatically and a number of play spots open up as the boulders and ledges are submerged. In the Summer of 2016, the Canada Falls dam gate broke and Brookfield drained Seboomook Lake and had high releases in August. I would definitely appreciate any information from boaters who were able to take advantage of those releases so that I can update this post. The bottom line is that you should check the release level before you head to Seboomook. Click here for the Seboomook release website. This is the bad part. It is a long ride. The best route is through Rockwood. GPS directions are accurate here, but there will be no cell service once you pass Rockwood. 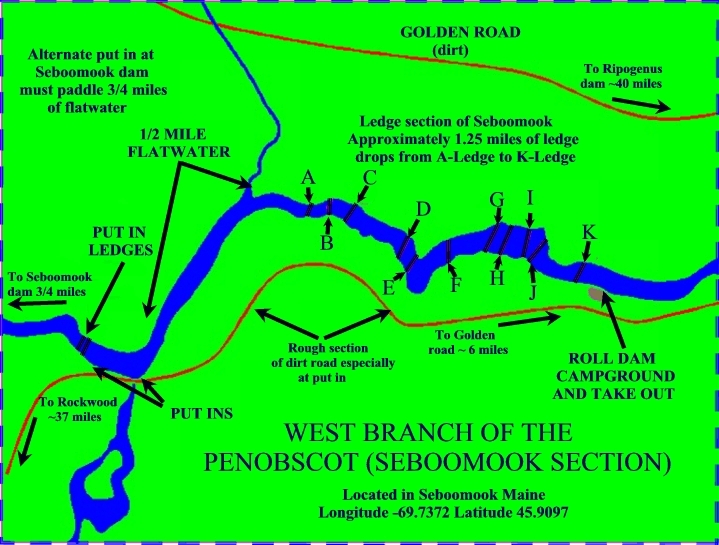 Take the bridge over Moose River to the Northern Road for 19.5 miles until it ends at Seboomook Road. The Twenty-Mile checkpoint has been abandoned so there is no charge. If you take a left on Seboomook Road, Pittston Farm, which has supplies and a restaurant, will be about 100 feet down the road. Take a right at the end of Northern Road, drive approximately 12.5 miles on Seboomook Road and then bear left onto Seboomook Dam Road. Going straight, instead of taking a left, will take you to the Seboomook Wilderness Campground. After about two miles on Seboomook Dam Road, the dam will be visible on your left and the put-in is 3/4 mile down the road. Click here for put-in map link. Most people stay at the iconic Roll Dam campsite. However, this site has the heaviest concentration of bugs around and is just plain brutal. Its only saving grace is being located at the take-out. To avoid the bugs, head up to the sites around Seboomook Dam where a nice wind off the lake keeps the bugs down. To make your trip memorable, go to the lean-to at the Seboomook boat ramp where there is a white cross with “RIP” written on it. Kind of creepy, but the campsite is comfortable. Make sure to wear garlic around your neck and bring wooden stakes just in case. The normal put-in is a turnoff from the road about 3/4 mile from the dam. Most people don’t bother with the two ledge drops upstream since that involves a longer walk, the drops aren’t worth it at 500 CFS, and there is a long flat water paddle after you run the drops. However, at higher releases, a nice play wave forms at these ledges. Click on the Rapid Titles below for a Google Map of the rapid. From the roadside put-in, there is a 1/2 mile flat water paddle to A-Ledge. Keep your eyes peeled for eagles and osprey. There are plenty of fish in this area and the birds may put on a show for you. If you have a fly rod, the rocks just above this rapid normally hold fish. The first ledge is a basic double drop, hence the name. There is a small play wave for some surfs at the small opening wave, and the bigger, second drop offers great surf opportunities from the eddy on river left. It’s great for spins and blunts, but be sure to roll up quickly as there are some shallow spots just downstream. The river curves around to the left and there is an easy drop down into a hole, which is surprisingly deep. There are some surfing opportunities, but be forewarned–this hole will pull your bow down for a nice ender, voluntary or not. For an alternative line, take a far river right line for a rock-splat to boof into the eddy. This is an easy pour over, which offers a very safe spot for some side-surfs along the pour-over line. This is a river wide pour-over that is just a matter of picking a way through the rocks. There are some opportunities for side-surfs and jet ferries along the pour over. This is a basic, river-wide pour-over. Just find a path through the rocks. This is a good spot for enders and side-surfs on an easy pour-over hole. This is a perfect wave train, awesome for kickflips and downriver moves. You can try to surf a hole about half way down the rapid which is perfect for flat spins. The name is a nod to our Canadian friends. After this ledge, you will go through the Maze, which is a series of small drops and pour-overs through the rocks. This drop calls for a leap of faith. The run is on river left and you just need to hug the rocks on river left as close as possible. There are submerged rocks throughout this drop and you can boof over them. There is some opportunity for a boof down the center as well. This is the best surfing spot on the river, and this wave should be called “Mini Garb.” It is a fun rapid to run since you will get a little air when you hit the wave, but the real fun is turning upriver to surf. From the eddy on river right/surfer’s left, paddle up to the eddy line and then drop down to the wave, which will catch you in the pocket, but that is only half the battle. You can also take a far right line over a little pour over and directly into the eddy. This is perfect for beginners to learn how to boof with little consequence. This is the last rapid of consequence and you can hike up from Roll Dam to watch the sunset. This is a straightforward ledge drop into a fluffy hole/wave. You will definitely get your face wet. This is a tough spot to surf because the tongue of water will tend to drive your bow below the surface, but that will give you a chance for some vertical moves. There is a nice sandy spot on river left to hang out for a quick swim or snack. This the last drop and can be boofed on river left or you can take an S turn path through the rapid. On the far left, the pour over may pull you back in so make sure you pay attention to your boof move. It is always embarrassing to swim on the last rapid. The pour-over gives some play opportunities, but the depth in certain spots limits vertical moves.
. . . And taking it a bit too far. The take-out is on river right and the bugs will be waiting for you. Run to your truck and fire up for another run. Picture Herb Brooks with his whistle yelling “Again,” and keep running Seboomook until you are exhausted. If you have any additions or suggestions for this post, please email at SamMarjerison@gmail.com and I will add them to give the best and most up-to-date information possible.